I went to the theatre to see this show with a somewhat petulant review from a well-known English critic in my mind. ‘Impertinent’ he wrote (amongst other things), referring in this case to the use of Igor Stravinsky’s first name in the expanded title. Well I found iTMOi, despite its odd title, a fascinating show. Did I understand what was going on? Not completely. But then that was part of the show’s appeal. It generated a conversation with my companion, which went on for some time. Was it an example of that dreaded concept, postmodern? Did it relate to French literary theory? And so on. 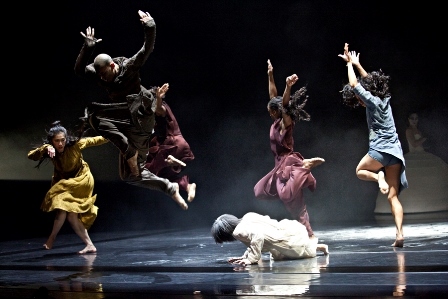 The work, choreographed by Akram Khan and danced by his company, is in celebration of Igor Stravinsky and the centenary of his ground breaking composition, The Rite of Spring. Khan sets out, somewhat ambitiously, to investigate Stravinsky’s transformative approach to musical composition. But iTMOi also had, at least in my mind, more than one reference to the Nijinsky ballet created to the Stravinsky score. One dancer, small and vulnerable, is ‘chosen’ to bear the torment of the other dancers when a woman in a crinoline with a top that exposes her breasts throws white dust in her hair. The work opens with the sonorous sound of a bell ringing over and over and a preacher of sorts shouting, or perhaps ranting is a better word, about the biblical story of Abraham, Abraham’s willingness to sacrifice his son Isaac, and the intervention by which Abraham’s god provides a ram in a bush as a replacement sacrificial body. ‘And the angel of the Lord came down’, the preacher shouts. (It took me a while to work out, I have to admit, that the dancer dressed as a horned beast who dragged himself across the stage at various intervals was probably the ram in the bush). From there we were bombarded with a score that went from sounding at times like a gramophone needle stuck in the groove of a vinyl record to being a variation on the religious prayer, kyrie eleison, not to mention the inclusion of what seemed like the ‘beep’ of a truck reversing. The score is the work of three composers, Nitin Sawhney, Jocelyn Pook and Ben Frost. The dancing by Khan’s company was stupendous. Sometimes they looked like whirling dervishes. Sometimes they were totally idiosyncratic, as was the case with a male dancer wearing a hooped skirt who turned variations on a cart-wheel and balanced on his hands while transforming his feet into an expressive instrument. But the dancers were always powerful movers as they stamped, twisted, turned and threw themselves around the stage. The show was visually mesmerising as well with its strong lighting design and frequent use of shadow play. Michel Foucault once wrote: ‘One day, perhaps, we will no longer know what madness was…All that we experience today as limits, or strangeness, or the intolerable, will have joined the serenity of the positive’. And was that Foucault’s pendulum (the other Foucault that is) swinging back and forth as the work closed? Dance doesn’t usually offer the opportunity to wonder and ponder to the extent that was offered by iTMOi. I’m glad that all dance is not like iTMOi, but it was an exceptional experience to have seen it.